2012 is to be a year in which we get to know self in preparation for Earth, and those inhabitants who so choose, to ascend to higher dimensions of consciousness. There are many avenues of assistance in getting to know self. 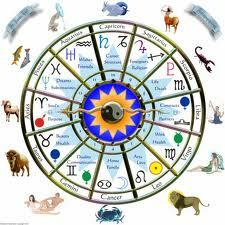 As a professional counselor who used astrology as a counseling tool, I know first hand that astrology far exceeds all other methods. Using the client’s astrological natal chart allows very precise, detailed information regarding him/her as a unique individual. As a professional counselor, I had access to and could compare the results of standardized personality tests with the natal chart. The two are like nursery school and graduate school in the amount of individualized information they provide. A standardized test report reads much like a copy of the report on a previous client. The same is true of all other standardized means of testing or knowing self. This article is based on Maslow’s Hierarchy of Needs, which can be very helpful in determining where an individual is focused in his spiritual evolutionary process. Using the astrological natal chart in conjunction with Maslow’s Hierarchy of Needs greatly enhances the knowledge that can be ascertained in terms of individual responses. Just as Creator God does not duplicate a snow flake, individuals are not duplicated either. The astrological natal chart is the best possible means to know self as a unique being. I have found the natal chart to be restricted in the information it affords only by the amount of time allotted to study it. The natal chart is a limitless treasure chest of self-discovery! For those who simply wish to study their Sun Sign, go to: http://www.pathwaytoascension.com/astrology/index.htm and scroll down to the index of Sun Signs—meaning Aries, Taurus, etc. Your Sun Sign is determined by your date of birth. In case you do not know your Sun Sign, look under the title, Aries, Taurus, etc., and find your correct birth date and Sun Sign. We can learn much about self from studying our Sun Sign. The Sun Sign represents our Soul and is described according to Alan Oken’s three levels of spiritual growth: 1. Personality level, 2. Awakening to the Soul-Personality Relationship, and 3. Soul Centered Level. The level of spiritual growth needed for ascension is illustrated in Maslow’s Hierarchy of Needs by the 5th Step – Self-Actualization. Likewise, the level of spiritual growth needed for ascension is illustrated in much greater detail in the Astrological Natal Chart by the Soul Centered Level. Using these two indicators can be an excellent resource for us as we increasingly strive to progress on our spiritual evolutionary path to ascension. I encourage all to embark on this very exciting journey of self-discovery and knowledge. Knowing self is the way to self-esteem … to being who you really want to be … and the pathway to ascension. ARE WE BEING WHO WE REALLY WANT TO BE? Our world is in a tremendous state of flux. A natural reaction to living in a constantly changing world is to cling to the familiar, even when it does not ring true to our heart’s knowing. We seek to belong, to be acceptable to others, to find solace in something outside ourselves. Few of us dare to be who we really want to be. Even fewer are consciously aware that we would be very different if we were living authentic lives. Instead, we pretend to be content living as one among many. We fear standing out, being noticed as a unique individual, or having others perceive us as out of step. As 2011 draws to a close and the magnificent, transforming energies of 2012 emerge, we need to pause and assess where we are and who we really want to be. 2012 is to be a time of growth in consciousness, of ascending to an expanded level of comprehending life and our role in it. 2012 is to be the beginning of our opportunity to create a loving, peaceful society … to reunite with our galactic brothers and sisters … to become a galactic society. In order to take advantage of these marvelous conditions for spiritual growth, we need to honestly evaluate our present way of life. Maslow’s Hierarchy of Needs provides an excellent avenue for determining where we stand in our spiritual evolutionary process. If our goal is ascension, we need to be living in accordance with the 5th Step – Self-Actualization. First Step = Physiological Needs – The basic survival needs of food, air, water, and sleep. Lacking adequate amounts of these elemental needs renders us unable to satisfactorily take the next Step on the pyramid. Second Step = Security Needs – Although these needs are important, they do not determine whether or not we can function well within society. Security needs are safety, shelter from the environment, health care, and a means of earning a steady income. 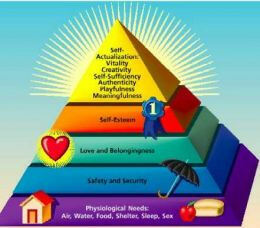 Third Step = Social Needs – These needs constitute essential ingredients for human wholeness and well-being. We need to feel that we belong within a group of meaningful relationships, to experience familial and romantic love. Involvement in social, community, and spiritually oriented activities enhances personal fulfillment. Fourth Step = Esteem Needs – Once the above three Steps are satisfied, we need to experience being appreciated, success in an endeavor, genuine praise, personal worth, a feeling that our lives count for something—that our presence makes a difference. Fifth Step = Self-Actualizing Needs – This Step signifies the peak experiences in being. At this stage of spiritual evolution, we may attain ascension into the higher dimensions of consciousness. To be self-actualized is to be who we really want to be, to have knowledge of our own self-worth, to be whole within self. It entails knowing that we are spirit beings having a human experience. We no longer are dependent upon the approval of others; we dare to be authentic regardless of what others think. 1. Self-acceptance & democratic world view – there is no discrimination against certain religious, racial, economic, or social groups. All persons are accepted for who they present themselves to be. Acceptance of self entails an honest knowledge of self—we are not pretending to be something we are not. No apologies are made for who we really are. 2. Realistic – the self-actualized individual feels free to explore and seek Truth without fear of being condemned or shunned by others. We can analyze and discern the real motivations behind particular actions or behaviors. Fear of the unknown is not a controlling factor. 3. Problem-centered – the self-actualized individual is motivated by a strong sense of responsibility and personal ethics. The desire to assist in creating a better life for everyone is often a driving force. 5. Autonomy – the self-actualized individual does not conform to the ideas of others regarding what constitutes happiness or contentment. Achieving the American dream or keeping up with the Joneses is not a motivating factor with the self-actualized—we more easily Live in the Now. 6. Solitude and Privacy – these conditions are important for the self-actualized, for it is within solitude that we discover who we really are and how to attain self-fulfillment. Feeling the need to always be with others is a sign that we are not comfortable with who we are pretending to be. 7. Philosophical sense of humor – the self-actualized generally possess a thoughtful sense of humor. We can laugh at ourselves and situations that occur, but do not enjoy humor derived at the expense of others. 8. Spontaneity – the tendencies to be open, nonconventional, and spontaneous characterize the self-actualized. We generally conform to social expectations, but do not feel confined by them. 9. Enjoy the journey – Although self-actualized individuals have concrete goals, we do not view particular methods as simply a-means-to-an-end. The journey toward the goal is just as important and enjoyable as attaining the goal. That the goal be achieved honorably is essential. Once we ascertain the Step within the Needs Hierarchy on which we are personally functioning, we can see a map for our lives unfold before us. Regardless of the Step on which we presently stand, we all have the inalienable divine right to call to God, our angels, and our spirit guides, requesting their assistance in preparing us for ascension. That help is ever-present, waiting on an invitation to intervene in our lives. Because we live on a freewill planet, we must ask, be ready to listen, and follow our personal divine guidance. Remember we are learning to be self-sufficient, to be whole within self, to know that we are child gods make in Creator God’s image. How we relate to the world around us greatly depends upon how authentic we are in our self-expression. For this reason, it is essential to look at ways by which we are controlled by others. This can be a painful process, but a necessary one if we truly desire to stand on Step 5 and ascend into higher consciousness. 1. We are taught in a variety of ways—subtle and overt—that in order to belong to a particular religion, political party, or group, we must adhere to what that group stands for. If we fail to do so, the common practice is some form of shunning, even to the point of excommunication. If we are choosing ascension, we must evaluate what each group to which we belong represents. We must ask: “Does this group stand for what resonates in my heart as being authentic to who I truly am? Does it require that I hand over my power to its leaders? Does it allow me to continue on my journey towards ascension?” We must be congruent within and without. We must learn to think for ourselves … to seek Truth on our own. Someone else’s truth can cripple our own spiritual growth. The painful lesson involved is that, without exception, all groups resemble far more closely 3rd dimensional plane of duality thinking as contrasted with the perfection we will find on the 5th dimensional plane of Divine Love & Light. We have yet to adopt 5th dimensional thinking. In plain language, we live within a matrix of lies that has existed for thousands of years. That’s what 2012 and ascension is all about—we are waking up to the lies that have controlled and enslaved us. An example that is breathtaking when we discover the contrast in the dictionary/thesaurus meanings and synonyms of two words we hear blasted over the communication media on a continual basis. Our society encourages us to choose: conservative or liberal. Both sides demonize the other. What we are seeing in our current political arena is a final war between the two. Let’s look at the meanings/synonyms as presented on www.dictionary.com and www.thesaurus.com. Definition of Conservative – (www.dictionary.com) – disposed to preserve existing conditions, institutions, etc., or to restore traditional ones, and to limit change. Synonyms for Conservative – (www.thesaurus.com – using the underlined synonyms) – bourgeois, controlled, conventional, constant, fearful, firm, guarded, inflexible, obstinate, quiet, [the] right, orthodox, sober, steady, stable, unchanging, timid, traditional. Definition of Liberal – (www.dictionary.com) – favorable to progress or reform, as in religious and political affairs. Synonyms for Liberal – (www.thesaurus.com – using the underlined synonyms) – advanced, avant-garde, broad, enlightened, flexible, free, humanitarian, indulgent, intelligent, interested, [the] left, lenient, loose, magnanimous, radical, rational, reasonable, receptive, tolerant, unbiased, unconventional, understanding, unorthodox. Both conservative and liberal have additional synonyms listed on this website in case you would like to see them. Which describes you as you are presently expressing self? Is this the authentic you? Both Conservatives and Liberals have heretofore played a vital role in maintaining an orderly society on the plane of duality. However, as we move into 2012, the conservative characteristics will not easily fit into the transformation that will take us into 5th dimensional thinking and creating. Everything is changing—literally everything. 2. Another common way by which we are very subtly controlled amounts to lying to the public via the use of dysphemism – the substitution of an offensive word with one more neutral or carrying a favorable connotation. Example: The results of war are described with the words collateral damage instead of openly saying killed. In this way, the true extent of war damage is not revealed—unless we are wise enough to research on our own. Code names accomplish the same goal of withholding information from the public. Example: Project Blue Book – could there be a more neutral name? It gives absolutely no clue to the public. In truth, between 1947-1969, the United States Air Force actively investigated reports and sightings of UFOs. This research project was identified by the code name Project Blue Book. Unless we are thinking for ourselves and research on our own, we remain ignorant as to how our tax money is spent. To accept at face value what the authorities tell us is to function on Step 3, where the need to belong is stronger than the urge to step outside the group and investigate for ourselves. Once we emerge from this need to belong, it is far more difficult for others to control us. 3. An additional method of subtle control is through the use of talking points. Talking points are devised to assist one side in a debate or competition. Because the motive is winning, not truth-telling, talking points possess various degrees of factual information. Example: During the 2010 mid-term elections, a major talking point was “Jobs, Jobs, Jobs.” As politicians prepare for the 2012 elections, a suggestion has been made that the talking point “Jobs, Jobs, Jobs” be changed to “Careers”—a word that connotes both a higher paying and more permanent means of earning a living. We have the option of blindly going along with the new talking point or doing our own research into the difference between job and career. Checking the dictionary can be a valuable practice. Let’s do so. The use of a dictionary and thesaurus alone can begin the process of empowering us to better understand the language of those in power? As we seek information on our own, we embark on the journey from Step 3 to Step 5. We learn to think for ourselves. Thinking for self is a prerequisite for reaching Step 5. As long as we allow others to tell us what we are to think, how we are to act, what we are to do, we give away our power to be authentically who we are. This does not mean that we behave in ways that harm others. Instead, we make God’s Universal Laws the foundation of our lives. Godspeed to all as we strive to be who we really want to be! Filed under: 2012, Ascension, Authentic Self, Divine Plan, Enlightenment, Full Consciousness, Hierarchy of Needs, Holistic Spiritual Growth, Maslow, Politics |	Comments Off on ARE WE BEING WHO WE REALLY WANT TO BE?